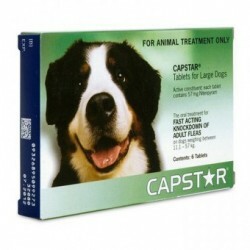 Eliminating fleas on your pet is easy with Capstar® (nitenpyram) because CAPSTAR provides fast flea relief for your dog or cat. Capstar There are 2 products. 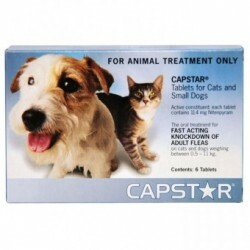 Eliminating fleas on your pet is easy with Capstar® (nitenpyram) because CAPSTAR provides fast flea relief for your dog or cat. In fact, it begins to work within 30 minutes to kill adult fleas.